This second Bank Holiday weekend qualifier at the Glebe saw another full capacity field in attendance with one hundred and ten (110) anglers all competing for a place in September’s big money final. Conditions for this tenth qualifier had not been forcast to be kind with several severe weather warnings in place in neighbouring parts of the country. However, fortunately the forecast for Leicestershire at least, proved to be inaccurate but it was still extremely humid with a stiff breeze bringing with it lots of threatening cloud cover. With the first half of the qualification phase nearly complete, places for the 2018 Mega Match This Grand Final at Maver Hayfield Lakes are getting harder to come by with just fourteen (14) pegs still available between now and the end of the qualification process come the end of August. Sam Collett topped a sellout qualifier event at The Glebe to qualify for his first major senior final event. Winner of this latest qualifier at the ever-popular Glebe fishery was Guru / Dynamite Baits-backed Sam Collett. The up and coming local rod has been on the fringe of qualifying for a big money event ever since winning the junior Fish O Mania event and has continued to impress ever since. 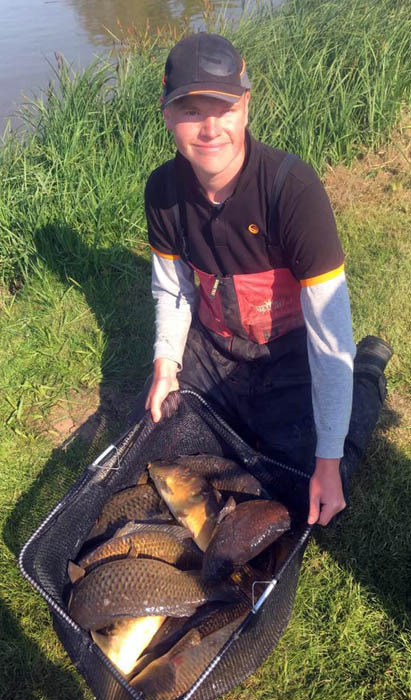 Sam drew peg 27 on Lake 1 and, despite conditions around the remainder of the complex being a little windy, found himself in an area of the lake seemingly unaffected by the wind with cruising fish in the upper layers. Sam opted to dob for these cruising fish whilst pinging pellets over the top at 14m to take 195-10-00 of carp to 8lbs. Sam will now fish his first big money final come September and qualifies for the Maver British Pole Championship final in the process. Runner-up on the day was Luke Bamford. The twenty eight year old Nottingham-based rod secured a lake win from peg 67 on Lake 4 with 179-07-00. Fishing paste long at 13m then down his edge late on, Luke found some quality fish to 8lb to book his place in this year’s British Pole Championship final in August. Rounding off the top three finish was former Match This finalist, Alix Feeney (Wayne’s Tackle). Alix drew peg 30 on Lake 1 and opted to start his match up in the water targeting cruising fish with pellet before switching to his edge for the final part of the match offering maggot and corn. Alix ended proceedings with 166-02-00 to take the last of the automatic British Pole Championship qualification places with fish to 8lbs.